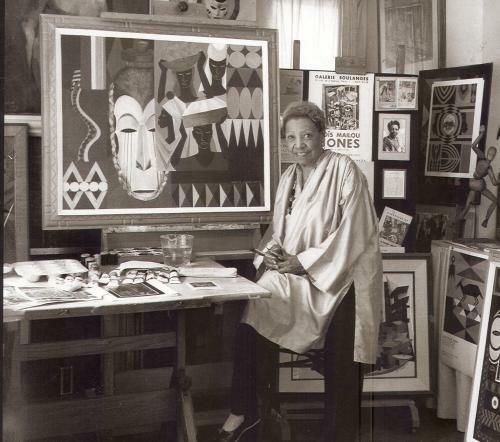 Visual artist Lois Mailou Jones was born in 1905 in Boston, Massachusetts to Thomas Vreeland and Carolyn Dorinda Jones. Her father was a superintendent of a building and later became a lawyer, her mother was a cosmetologist. Early in life Jones displayed a passion for drawing, and her parents encouraged this interest by enrolling her in the High School of Practical Arts in Boston where she majored in art. In 1927, Jones graduated with honors from the Boston Museum of Fine Arts and continued her education at the Boston Normal School of Arts and the Designers Art School in Boston. Jones’s formal career as a painter began on the island of Martha’s Vineyard when she met sculptor Meta Warrick Fuller, who inspired one of her earliest paintings, “The Ascent of Ethiopia,” a tribute to Africa and the Harlem Renaissance. Fuller later persuaded Jones to emigrate to France where she would be fully appreciated as an artist. In 1937, Jones took a one-year sabbatical from Howard University to study at Academie Julian in Paris. While living abroad, many of Jones’s works were inspired by the Luxembourg Gardens, boulevards, art galleries, and cafes of Paris. Her most celebrated Parisian painting, “Les Fetiches,” was a depiction of African Masks. Much of Jones’s art reflects her summer travels to Martha’s Vineyard and her travels to Africa and Haiti. Jones, however, credited France with giving her the freedom and stability she needed to flourish as an artist. After retiring from Howard University in 1977, Jones continued to exhibit, paint, and travel. Throughout her seven-decade career, she became the recipient of many prestigious honors and awards, including one from the Harmon Foundation and Corcoran Gallery of Art. Lois Mailou Jones, longest-surviving artist of the Harlem Renaissance, died at the age of 98 in Washington, D.C.
Charles H. Rowell, “An Interview with Lois Mailou Jones.” Callaloo. 12:2 (Spring, 1989): 357 -378); Fern Gillespie, “The Legacy of Lois Mailou Jones,” Howard Magazine (Winter 1999): 8-13; Lois Mailou Jones (1905-1998), http://www.phillipscollection.org/research/american_art/bios/jones-bio.htm.